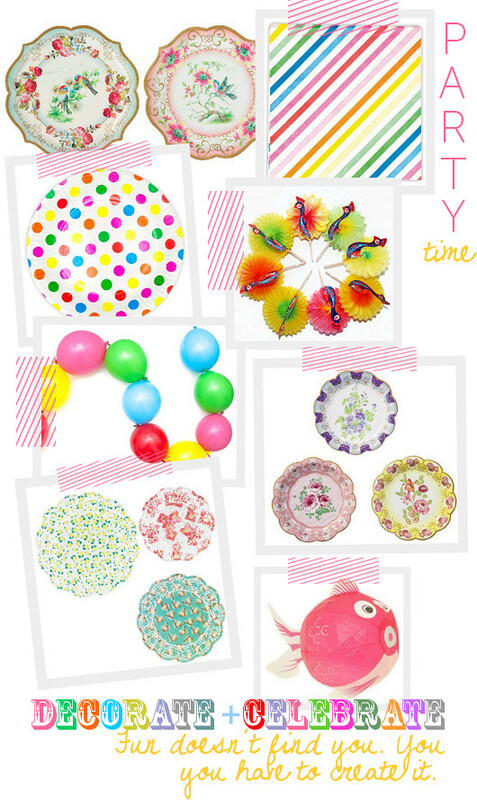 Whether you feel like throwing a party or not, these funky and colorful party supplies from Lang Zal Ze Leven discovered via Style Cookie, are sure to get you in the mood to either plan your next fest or decorate a room in your home. I love the punchy colors and despite that we're entering autumn, I still see these colors on my radar well into the fall and winter seasons because you can add neons and playful stripes and dots to just about anything for a burst of freshness. I find that simply adding the hot colors to the more subdued ones adds energy and positivity. Snow white with hot pink, black and silver for winter? Oh yes. Emerald green, mint, peach and orange with copper and neon orange accents for fall, yes yes a million times yes. Let's toss the traditional palettes this year and bring our spring/summer colors with us right into the cooler months to mix and match and have some fun, ok? Adding brights to moody tones is what I'm inspired by at the moment. What about you? But yes, back to parties and cute supply goodies. I love those paper plates that look like fancy china shown in the mix above, the patterned doilies, the Japanese fish paper balloons, dot and stripes on napkins, peacock swizzle sticks... And yes, this all looks a little summery I know, but if you mix in deeper shades, you can Autumn-it-up quite easily. Besides, there are no rules except that you love how you've decorated your party! That's the only rule that matters to me.